כביש Bruce Highway מחבר את בריסביין עם קיירנס. קיירנס היא מרכז האזור הצפוני של קווינסלנד, אחד ממוקדי התיירות הפופולרים באוטסרליה ומהווה נקודת מוצא לטיול ביערות גשם טרופיים, באיים רומנטים, ובחופים הנפלאים. 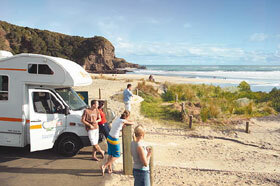 Pick up your motorhome from our depot in Brisbane and head north to Noosa. You will pass Glasshouse Mountains, giant cores of extinct volcanoes, and Nambour where you can ride a miniature train through tropical fruit fields. Travel to Noosa Heads where you will find some of Australia's best beaches. The spectacular cape at Noosa Head marks the northern end of the Sunshine Coast. The park has fine walks, great coastal scenery and a string of bays on its north side. Travel past Gympie, once the scene of a major goldrush, to Hervey Bay. Enjoy the safe beaches and watch out for whales between June and September. There are also organised whale watching tours. Please note: You can visit Fraser Island from Hervey Bay. Please ask for ferry crossings and 4WD hire. Your first stop today is Bundaberg, which is famous for its rhum distillery. It is a small detour from Bruce Highway but worth a visit. On your way further north you will pass Gladstone, access point to the first of the Barrier Reef islands, Heron Island. Driving further along the Bruce Highway you will get to Rockhampton. Spend the day in Rockhampton, a city lined with magnificent palm trees and tropical gardens. Visit Emu Park or take a cruise to Keppel Island and view the coral reef. The way up the coast leads through extended sugarcane fields. After Mackay you reach the Whitsunday Coast. Please note: If you have enough time you can make a detour to Eungella National Park. Most days of the year you can be pretty sure to see Platypuses close to the Broken River camping ground. The best time to see them is in the early morning or late afternoon hours. Take a few days to explore the Whitsunday Islands. There are a lot of one day trips to the reef. Most of the operators offer introductory dive courses. You can also hire some equipment and go snorkeling in the fascinating reef. You will be amazed by the colourful underwater world of the Great Barrier Reef. Drive north along the coast and get deeper into the tropics with every kilometre you drive. Stop on the way at beautiful beaches or enjoy the stunning views of the reef. On your way to Mission Beach you can make a small detour to Mt Spec Nationalpark . Here you will find Australia's most southerly pocket of tropical rainforest. You will be impressed by beautiful views of the coast on your way past Ingham and Cardwell. If you are travelling by 4WD visit Wallaman Falls, the largest single drop waterfall in the southern hemisphere. In the evening you will arrive at Mission Beach with its 14 km long sandy beach. Turn left just after Innisfail and make a detour through the Atherton Tablelands. On your way you will have plenty of waterfalls, you can visit lake Eacham and see the famous impressively giant Curtain Fig Tree. Make a stop in Kuranda and inspect Kuranda's historic railway station. Enjoy the evening in Cairns. A nice coastal strips leads you up along the coast to Port Douglas. Spend some time at the magnificent beach and drive further north to Mossman. Follow the signs to Mossman Gorge and have an one - hour walk through tropical rainforest. Drive back onto the main highway and further to Daintree. Take a river cruise up the Daintree River and you might be able to spot a crocodile or two. Take the ferry across Daintree River and drive another 37 km to magnificent Cape Tribulation. Spend the day exploring the tropical rainforest. If you want you can even book a guided nightwalk through the rainforest. Drive back to Cairns and drop off your motorhome.